In the interview with Reuters news agency, Khama said the situation in Zimbabwe was a big concern for the region, but was pessimistic of Mugabe's ability to improve the country's situation. "We're talking about a 92-year-old man and there's just so much you can do at that age to try and keep up. "It is obvious that at his age and the state Zimbabwe is in, he's not really able to provide the leadership that could get it out of its predicament," the Botswana leader said. "It is a big concern. It is a problem for all of us in the region — and it is a burden. There's no doubt about that." Breaking ranks with most of his African counterparts, Khama said there were many people who could lead Zimbabwe, calling for term limits of up to 10 years. Asked whether Mugabe should have retired, Khama responded: "Without doubt. He should have done it years ago. "They have got plenty of people there who have good leadership qualities, who could take over. "My opinion has always been that 10 years leading any kind of organisation — not just a country or a government, any organisation — is pretty much the maximum." Botswana under Khama has often been the odd one out in Sadc, calling on Mugabe to uphold the rule of law and condemned the country's elections, which the regional body has in the past been quick to endorse. Khama's sentiments come as Mugabe is eyeing a fresh mandate in two years' time when he would be 94, having ruled Zimbabwe since 1980. 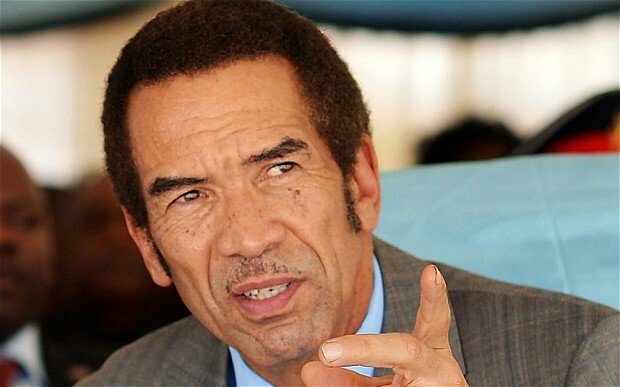 An estimated 100 000 Zimbabweans migrated to Botswana in the wake of Zimbabwe's economic and political crises, with Khama saying his country's jails held a "significant" number of Zimbabweans. During a Sadc meeting in May 2015 hosted by Mugabe, Khama is said to have clashed with the Zanu PF leader over the emotive xenophobic issues that continue to blight the region. "Let us address real issues and stop behaving as if South Africa is an employment bureau for the African continent," Khama reportedly told Mugabe, in a thinly-veiled reference to the millions of Zimbabweans that left for the country's southern neighbour for better prospects. "It is because of some of us, who have mismanaged our own economies, that we have an influx of foreigners into South Africa." Information minister Christopher Mushowe yesterday said he had not yet seen the report, inferring that it could have been concocted and was, thus, false. "I have not seen that story. Some of these are lies just to set up a fight between the two countries," he said. "I would need to look at the story before I can comment." Zanu PF political commissar, Saviour Kasukuwere said Khama had no right to dictate to Zimbabweans who should lead them. "We are a democratic country and President Mugabe was chosen by Zimbabweans. He has their full mandate and support," he said. "We respect Botswana's choice of leaders and no nation has a right to dictate to us who should be our leader." Khama’s second five-year term in office ends in 2018, when he will hand over to Vice-President Mokgweetsi Masisi in a clearly defined succession matrix that makes instability almost impossible.